A fund was created for those who wished to donate to us during this time. We determined that this money would be best spent to benefit the community. We decided to continue to allow donations throughout for a discretionary fund. We intend for future donations to go toward maintenance of our existing memorials, raising awareness of SUDC and the SUDC Foundation, and any other discretionary purpose. The swing is a parent/child two person swing, allowing both a parent and small child to swing together. We know Norah would have loved this in life, and her sister doesn’t stop laughing while swinging with mom and dad. We hope others will enjoy it in memory of Norah. The slide has been our biggest project to date. 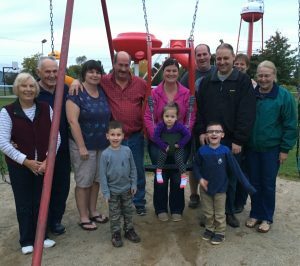 The funds for the slide were donated to Peck Community Schools, and the installation was done by friends and family. The slide can be seen on the elementary playground at Peck Schools. 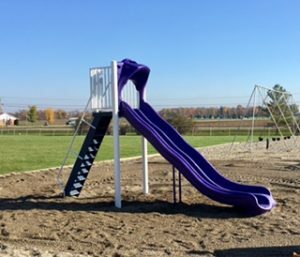 The purple color for Norah stands out on the playground, and we hope children will enjoy this slide for many years to come.